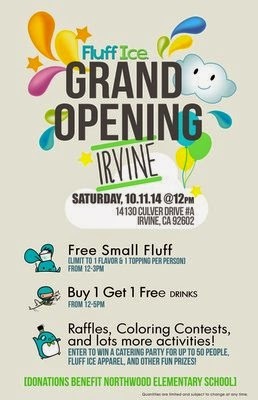 FREE FLUFF ICE FOR THEIR GRAND OPENING SAT. OCT. 11 - IRVINE - EAT WITH HOP! THIS SATURDAY, OCTOBER 11, 2014 FROM 12PM - 3PM! SO I PERSONALLY REALLY LIKE FLUFF ICE'S SHAVED SNOW! THEY SHAVE IT THICKKKKKKKKK AND THEY HAVE AWESOME ASIAN FLAVORS LIKE HALO HALO, THAI TEA, GREEN TEA, ETC. I ALSO LOVE THEIR FLUFF ICE CHARACTERS BECAUSE IT'S SUPER CUTE! WHEN IT OPENED IN COSTA MESA (ACROSS FROM ORANGE COAST COLLEGE) I WAS SUPER EXCITED AND NOW THEY'RE EXPANDING TO IRVINE! BEFORE THEY ONLY HAD LOCATIONS IN LOS ANGELES SO I'M HAPPY FOR THEIR EXPANSION. HOWEVER, I WISH THEY OPENED IN IRVIN WHEN I WAS STILL ATTENDING UCI... WHAT A SHAME... OH WELL! SO BOTTOM LINE, FLUFF ICE SHAVES IT THICK AND IT'S FULL OF FLAVOR! I LOVE THEIR FLAVORS! THEY EVEN SERVE TYPICAL BOBA DRINKS TOO!